The Sangoma A102 board: Two spans of optimized voice and data over T1, E1, and J1. 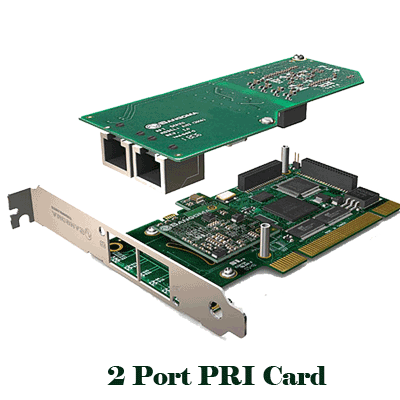 The Sangoma 2 port digital PRI card uses the same high-performance PCI or PCI Express interface that is providing superior performance in critical systems all over the world. It supports up to 60 voice calls or 4.096 Mbps of full-duplex data throughput over two T1, E1, or J1 lines.